A student of architecture, art and design at Leicester College of Art (1954-60) and sculpture at the Royal College of Art (1960-1964), David Hall went on to teach sculpture at Kingston University, London,and later St Martins School of Art, London. He very quickly became part of the challenge to the dominant object-based culture extant during the 1960s and was a founding member and contributor to the video art movement. Hall became progressively illusionistic after graduating from the RCA and, by 1968 he was making sculptures that only existed for the camera - either as photographs or films. He made his last ever sculpture, Displacement (Removal Piece) for the ICA’s 1969 exhibition British Sculpture Out of the Sixties. The sculpture consisted of a carefully delineated shape on the painted floor: the shape corresponding to a sculpture by Hall on display in Japan at the time, the sculpture’s absent form indicated by the paint being sanded away. Hall was the first practising artist to be awarded funding by the Arts Council of Great Britain for a series of films, including Motion Parallax (1968) and Vertical (1969), both of which explored space in the landscape. He was co-curator of the first video-installation exhibition at the Tate Gallery, London 1976; co-founder of London Video Arts (now LUX), 1976; a member of the Artist Placement Group (formed 1966); and founder of the first time-based media course at Maidstone College of Art in 1972. Awarded first prize at the Biennale de Paris in 1965, Hall took part in other key shows including: Primary Structures, Jewish Museum, New York, 1966; a solo show at Tate Gallery, 1974; the seminal international Video Show exhibition at the Serpentine Gallery, London in 1975, of which he was also co-organizer, and more recently bringing to a dramatic conclusion the switch from analog to digital broadcast transmissions with 1001 TV Sets (End Piece) (1972–2012) at the Ambika P3, London. 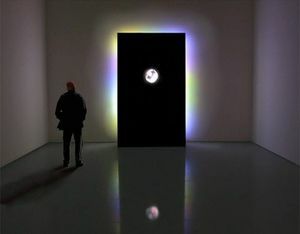 Hall succeeded in making video art an autonomous art form and bringing to the forefront the notion of “time-based media”.